Jordan Wise is a mild-mannered accountant with a large San Francisco engineering firm in the late 1970s. By his own admission, the first thirty-four years of his life were dull, empty. But that all changes when he meets and falls in love with Annalise Bonner, an ambitious young woman who craves excitement and a life on the edge. With her as the catalyst, Wise concocts and executes a meticulous plan to steal more than half a million dollars from his firm. They escape to the Virgin Islands, but their plans to live a life of quiet luxury are beset by unexpected pitfalls—and Wise is forced to carry out two more ingenious schemes as a result. All three of his crimes are perfect—or are they? 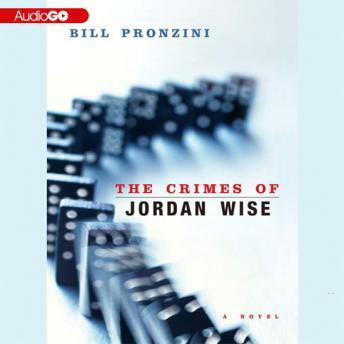 The Crimes of Jordan Wise is a classic tale of love, greed, betrayal, and violence told with Bill Pronzini’s characteristic twists and turns and his special brand of suspense. It is also a powerful psychological examination of a man, a woman, and the wages of sin.